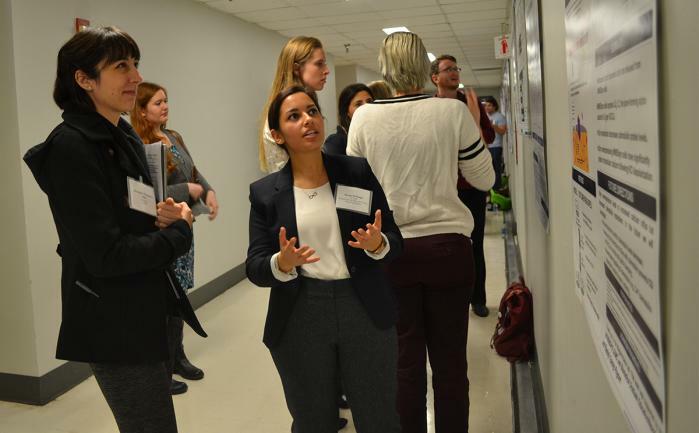 PhD students across Georgetown University Medical Center showcase their research at Student Research Day 2018. 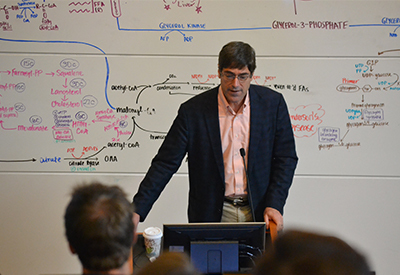 (October 20, 2018) — The hallway of the Preclinical Science building buzzed with students, faculty and members of the Georgetown University Medical Center (GUMC) community during Student Research Day on October 16. Every fall, doctoral students are invited to showcase their research through oral presentations and poster sessions while judges select the best presentations in a variety of categories. “Student Research Day is really important because it gives students the opportunity to develop their presentation skills, receive feedback on their work and share research with members of the GUMC community,” said Caleb McKinney, PhD, assistant dean of graduate & postdoctoral training & development in the Biomedical Graduate Education (BGE) program’s Office of Career Strategy and Professional Development. NPR reporter and award-winning journalist Richard Harris addresses the GUMC community as the keynote speaker for Student Research Day 2018. One of the key issues Harris highlighted was reproducibility in biomedical research and the importance of rigor within academic institutions. Some scientists consider reproducibility to be a crisis in the current scientific landscape but Harris offered a different perspective. McKinney found Harris’ message incredibly relevant for students. Although Student Research Day has been around for over 25 years, there was one new element to the event in 2018 — first-year PhD students were able to present their research. “We wanted them to have the opportunity to start developing these presentation skills earlier in the process,” said McKinney. Marissa Laws (G’23) and Plamen Nikolov (G’23) win in the category of first-year rotation posters. 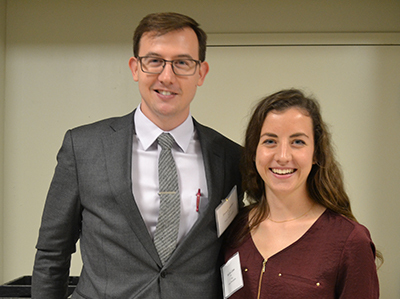 To highlight their accomplishments, a special category for the poster session was created for first-year students, with Marissa Laws (G’23) and Plamen Nikolov (G’23) receiving first and second place respectively. When asked about the experience, Nikolov expressed surprise at winning. “My only goal was to explain, coherently, what the project aims were and it’s especially difficult to do that when you can have an audience from any program,” he said. Laws and Nikolov agreed that the experience helped them continue to develop their presentation skills. While Student Research Day is primarily a space intended for students to share their work, it’s also an opportunity for the community to learn about research at GUMC. Nikolov expressed that seeing the work of his peers in other fields was especially beneficial. However, the audience at this year’s Student Research Day expanded beyond the PhD students presenting. Please see below for the list of Student Research Day award winners.